So! Buddhism arose in India as a path to escape the endless cycle of reincarnation (and the inevitable sorrow that comes with impermanent existence). It eventually migrated to China, where it merged with Confucian ritual & order and Taoist spontaneity & simplicity, splintering into lots of sects. One of these was Chan (Zen in Japanese), which rejected much of the complex rituals in favor of simple seated meditation (zazen; sometimes called “just sitting”), sincere devotion, and being fully present and aware of the “suchness” (tathatha) of each moment. Some people refer to Zen as “if Buddhism and Taoism had a baby,” which is reductive but has a lot of truth in it (in theory if not always in practice). Zen came to Japan and morphed again, picking up bits of Shinto and Japanese aestheticism (and plenty of new rituals and rules along the way). Importantly, Zen leaders preached that, because of the fundamental non-duality of existence, there was no actual divide between the sacred and the secular, meaning anyone could achieve enlightenment by existing fully within the Here And Now as they went about their daily lives. You didn’t have to be ordained to realize buddha-nature anymore. 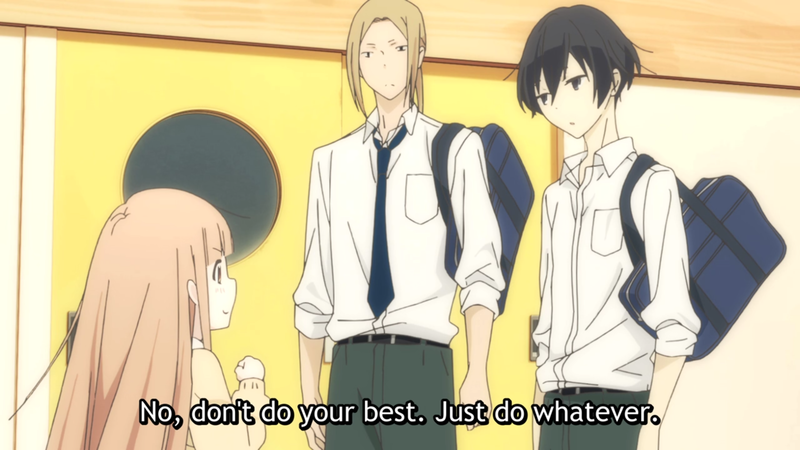 So how does this relate to Tanaka-kun? For starters, with Tanaka himself, whose character reads like both a parody and a love letter to the Devoted Layperson—except, instead of Enlightenment, he is seeking Perfect Listlessness. Tanaka turns listlessness into a discipline, complete with his own rituals and philosophical musings, and takes “just sitting” to an absurd level as he moves ever closer to the highest realm of laziness. 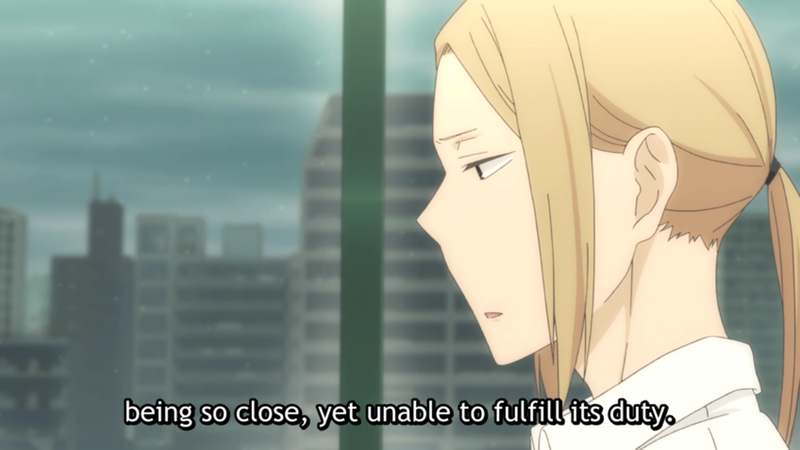 Tanaka is still only human, and as prone to getting tangled in his own stubbornness or insecurities as the other characters. His attempts to achieve Perfect Listlessness can also sometimes be in direct opposition to Zen tenets (although given the somewhat paradoxical nature of Buddhism, where you need to stop grasping in order to attain, maybe he’s closer to Nirvana than any of us). Fortunately, when Tanaka stumbles, the series itself is there to pick up the slack, using its art and themes to fill the show with a modern Zen aesthetic. Studies on Zen Buddhist architecture describe it as a combination of (1) Confucian organization and symmetry, (2) Taoist simple clarity through emptiness (where the “reality of the room” is found in “the vacant space enclosed by the roof and wall themselves”), and (3) a desire for “harmony with nature.” Or, as Tofugu puts it when describing Zen rock gardens: “Even though the trees and patterns often stand out a lot more, that blankness, that stillness, is just as crucial.” All of which is intended to clear your mind, calm your spirit, and keep you constantly aware of the world beyond the (delusion of the) self. Tanaka’s world and especially his (super-nice) high school embody many of these general architectural principles: Simple designs, clean lines, organization and symmetry softened by curves, empty, open spaces, and the almost constant presence of natural elements (from the color scheme itself to the rows of trees to all that lovely natural lighting). 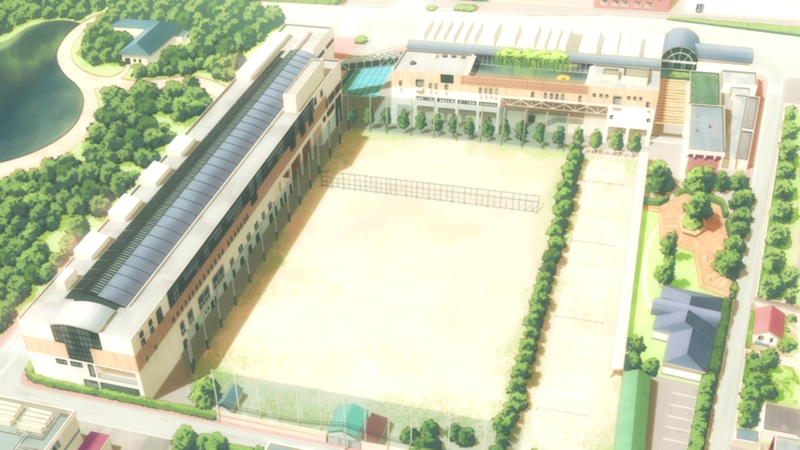 Tanaka’s school is actually based on a real high school in Hiroshima, but the anime design team made it a point to use a lot of wood and stone (rather than metal and plaster) in their version, giving it (and, by extension, the series as a whole) a much warmer feel. 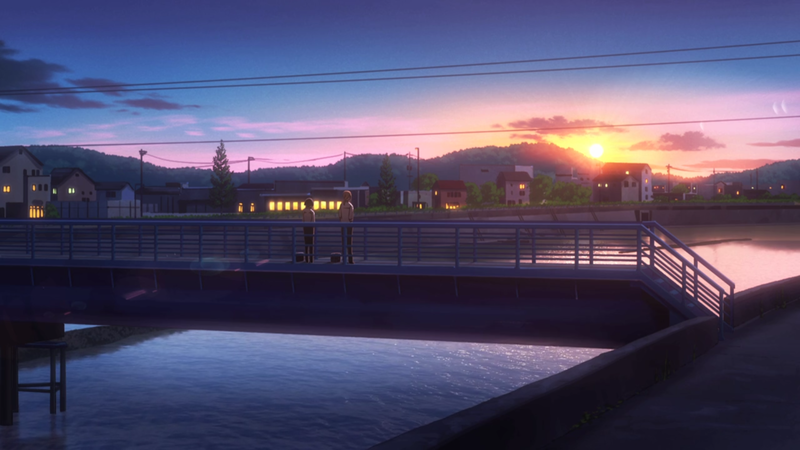 The art and storyboarding has some of this same attention to simplicity and naturalism, particularly in the show’s most relaxed “Tanaka and Ohta just hanging out” moments. Backgrounds vanish, offering us an uncluttered screen so we can focus on the here-and-now interactions; or our characters stand before a backdrop of nature, blending in with the world around them. Both the separation and the unity are integral; two sides of the same coin; non-duality at work. And let’s not forget the show’s general laid-back, accepting attitude, or the way Tanaka does indeed appear to be trying (and failing) to copy sutras during the episode previews. Again, I don’t think Tanaka-kun is intended to be a religious work, but I do think it’s aware of the kind of atmosphere it wants to create and draws on Zen and Taoist philosophy and aesthetics to accomplish that: A focus on everyday life; an appreciation for nature and the unique impermanence of each moment; an offbeat sense of humor (yep, Zen and Taoist writings can be pretty funny, too); an abiding affection for the flawed, frantic people who live within its world; and a constant, gentle reminder of the importance of clearly seeing the “Inner Nature” of things. 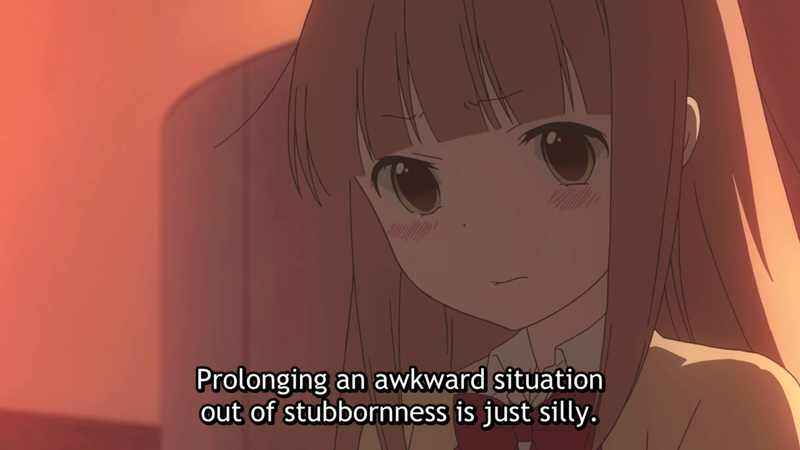 Almost every conflict in Tanaka-kun stems from somebody ignoring that Inner Nature—when characters try to force square pegs into round holes, getting so caught up in how they want things to be that they can’t see them as they are. Tanaka’s Battle with the Brolly is a brilliant little example of this, as he refuses to use a simple tool for its designed purpose and ends up causing far more problems than if he’d just used the umbrella as an umbrella in the first place. 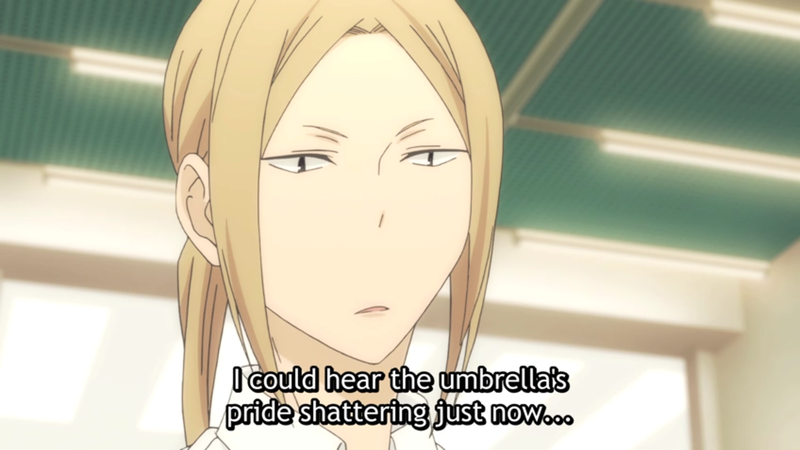 Ohta (the most clear-headed of the cast) even sympathizes with the poor umbrella, who’s not getting to do what it’s made to do. This tension between delusion and truth comes up constantly in the other characters’ conflicts as well, and almost always leads to (light, silly) complications, such as tiny, hard-working Miyano’s fight to be “mature” and listless. It’s not that Miyano shouldn’t be allowed to change if she wants to, but that she rejects qualities about herself and tries to attach new ones as if it were as easy as changing hats. Self-change is a constant, steady process that requires acknowledging one’s current nature and then, rather than beating it with a hammer, gradually bending it into the desired shape. 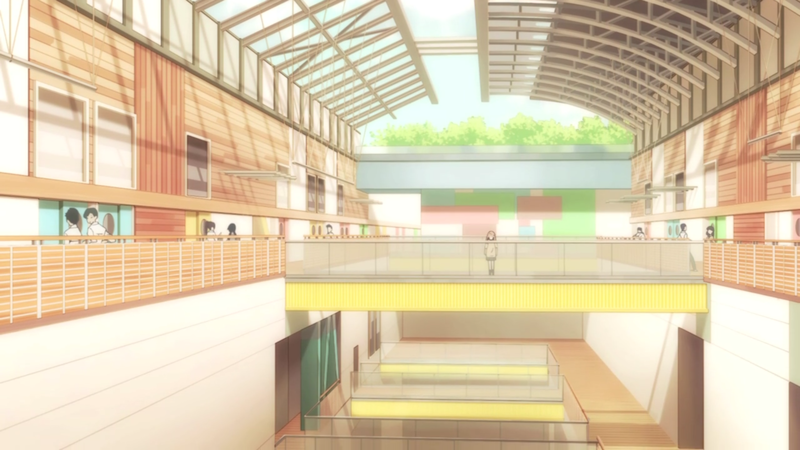 Of course, while the show’s interest in Inner Nature and Change may have roots in the philosophies and religions that have long been a part of Japanese culture, it’s also related to something a bit more grounded and immediate than that: High school and adolescence. But that’s an essay for another day. I pulled from a ton of sources from this one, including original texts (like the Tao Te Ching), and historical/theological studies (including a really neat book called Women of the Way about female Buddhist practitioners). Some of them I read so long ago that I can’t properly cite them here, but Benjamin Hoff’s The Tao of Pooh (c.1982) and Peter Hershock’s Public Zen, Personal Zen (c.2014) served as comprehensive refresher courses, so they deserve special mention. 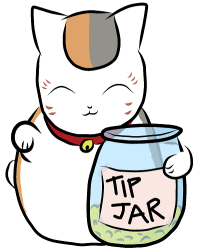 On that note, I’ve spent a lot of time studying (and a little time practicing) this, but I’m still plenty prone to error. If I swung and missed wide, feel free to let me know and I’ll work to correct my mistakes and come to a better understanding of the material. Intelligent and illuminating – great slant on the series. I’ll never watch in quite the same way again.